Protein has been an extremely popular nutrient and has drawn a significant amount of attention from high school athletes all the way up to the professional level regarding its use in athletic performance. I’ve heard everything from eating more protein increases muscle size, makes me stronger, or gives me more energy. All are completely false if you’re already eating enough protein. We’ll discuss the functions of protein in more detail but most importantly, I’ll address the key take home points you need to know about how this nutrient can help you as an athlete. Furthermore, I find where athletes are most confused is regarding how much do they actually need on a daily basis. 1. Metabolism – when we eat protein, our body burns more calories when we eat protein compared to carbohydrate than fat. Be sure to include a source of protein at every meal to keep your metabolism charged and ready to go. 2. Satiety (Fullness) – this is extremely beneficial if trying to drop body fat or get leaner as it minimizes your chances of eating more food throughout the day. When you combine a meal of protein, fat, and fiber, you have the 3 components that stabilize blood sugar and keep you full longer. 3. Repairing Muscle Tissue – after an intense exercise session, particularly a strength training session, our muscle tissue breaks down (catabolism). The research has demonstrated consuming a source of protein within 30-60 minutes after a workout, especially when combined with a source of carbohydrate, has improved strength, reduced muscle soreness and inflammation, increased muscle fiber size, and protein synthesis (rebuilding of muscle tissue 4. Hormonal Change – good protein intake can increase the release of the hormone Glucagon which can reverse the process of too much insulin release in the blood which can facilitate the fat burning process. Whole Food Protein, Whey Protein, and Casein Protein. I get asked quite frequently, what is the biggest difference between eating a chicken breast, beans, or drinking a nutrition shake. The answer is absorption rates. Research has demonstrated whole food protein sources are absorbed slower than a liquid protein shake that contains Whey Protein. Whey Protein – fast acting protein that elevates blood amino acid levels quickly which last for 3-4 hours. Whey protein is best consumed when you wake, immediately before, and within 30-60 minutes after a strength training session. Casein Protein – slow acting protein that elevates blood amino acid levels slowly which last for 6-8 hours. Casein Protein is best consumed before bed to minimize the amount of protein your body uses while you rest. 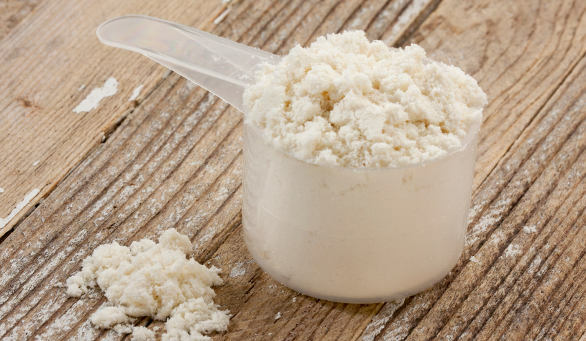 Foods like Cottage Cheese and Milk are good sources of Casein Protein. Use in Athletic Performance First and foremost, you want to make sure you’re eating every 3-4 hours and a source of protein is included in each meal. To take your performance to the next level, you want to be sure you’re consuming protein around your workouts to maximize muscle growth and recovery. The best way to do this is to consume a source of protein, preferably in liquid form, 30 minutes before your workouts and within 30-60 minutes after your workouts. We’ll break this down into 2 different types of athletes, strength and endurance as those who lift weights on a regular basis (3-4 days/week) need a little more protein than those who do not. Strength Athlete: (lift weights 3 or more days/week) – 0.8 grams/pound of body weight. Example: 200 lb athlete = 200 x 0.8-1.0 = 160-200 grams of protein/day Endurance Athlete: (cardio only based training sessions) – 0.6 grams/pound of body weight Example: 150 lb athlete = 150 x 0.6-0.8 = 90-120 grams of protein/day.